Motives are the main springs of action in people. The leader who wishes to incite his men to reach an objective must hold out the promise of reward once the objective is attained. What rewards do people seek in life? The answer is that they seek to fulfill their wants, drives and needs. The term “motive” implies an action to satisfy a “need”. Psychologists often use the term need, wants, drives and motives” interchangeably. Motivation can be defined as a willingness to extend energy to achieve a goal or reward. As Burleson has defined the term, a motive” is an inner state that energizes, activates or moves (hence ‘motivation’) and that directs or channels behavior toward goals. In entire class of drives, desires, needs, wishes and similar forces. The concept of motivation is central to this goal. This term is used in management theory to describe forces within the individual that account for the level, direction and persistence of effort expended at work. Simply put a highly motivated persons work hard at a job an unmotivated person does not. A manager who leads through motivation does so by creating condition under which other people feel inspired to work hard. Obviously, a highly motivated workforce is indispensable if high performance outcomes are to be achieved consistently in organizations. A) ANCIENT THEORY: Theories of motivation before industrial revolution were known as ancient theory of motivation. In those days, men were considered as machines. Supplies of laborers were more than requirement. Industrialist did not bother to motivate the worker. The theorists assumed that motivation is M = E + V, Where M stands for motivation, E for expectation and V for variety of needs. Based on the above principles, Taylor established his piece- rate system-whoever works more will get more money. C) MODERN THEORY: The modern thought of motivation recognized as modern theory. The theorists claimed that men are only economic men until their physiological needs are fulfilled. It is seen that when these needs are satisfied & one has reached the subsistence level men will react to other needs. It is observed that man is not generally economic in nature. 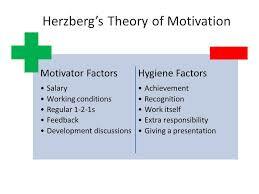 Fredrick Herzberg two-factor theory is another framework for understanding the motivational implication of environments. (Wiley 1967). The theory was developed from the pattern identified in the response, almost everyone to questions about their work. When questioned about what turned them on they tended to identify things relating to the nature of the job itself. Herzberg calls these satisfier factors. When questioned about what turned them off, they tended to is identifying things relating more to the work setting. Herzberg calls this hygienic factor. (Winter 1974). Herzberg two-factor theory is a useful reminder that there are two important aspect of all jobs (1) what people do in terms of job task- job content and (2) the work setting in which they do it- job context. His advice to the managers is two fold; (1) always correct poor hygienic to eliminate the source of job dissatisfaction in the work unit. In addition (2) be sure to build satisfier factors into job context to maximize opportunities for job satisfaction. The two-factor theory cautions managers not to expect too much by the way of motivational improvements from investments in such things as special office fixtures, attractive lounge for breaks and even high base salaries. Instead, it focuses on the nature of the job itself and directs attention to ward such things as responsibility and opportunity for the personal growth and development. These are things by the way that are consistent with the job enrichment and self managing team concept and with many current directions of empowerment in the new workplace. (Schermerhorn 1996). It ignores the situational variables. It assumes a positive relationship between motivation and productivity which is not true- this implicit. The research methodology that Herzberg followed was not entirely suitable and could not accept all the charitable factors and conditions. There was no methodology to find out the escapists. An overall measure was taken- but a person may like part of his job. His questionnaire methods tended to prejudice the result. Integration of Maslow and Herzberg “In a motivating situation, if you know what are the high strength needs (Maslow) of the individuals you want to influence, then you should be able to determine what goals (Herzberg) you could provide in the environment to motivate those individuals, At the same time, if you know what goals these people want to satisfy, you can predict what their high strength needs are”. Two principles are central to Maslow’s theory about how these needs affect human behavior. The deficit principle holds that a satisfied need is not a motivation of behavior. People are expected to act in a way that satisfies deprived needs- that is, needs for which a deficit exist. The progression principle holds that a need at one level does not become activated until the next lower level need is already satisfied. People are expected to advance step by step by the hierarchy in their search for need satisfaction. At the level of self actualization the more these needs are satisfied the stronger they are supposed to grow. According to Maslow, a person should continue to be motivated by opportunities for self-fulfillment as long as the other needs remain satisfied. Although research has not verified the strict deficit and progression principles just presented, Maslows ideas are very helpful for understanding the needs of people at work and for determining what can be done to satisfy them. His theory advises managers to recognize the deprived needs may negatively influence attitudes and behaviors. By the same token, providing opportunities for need satisfaction may have positive motivation consequences. Fig 1 is an example of how managers can use Maslow’s ideas to better meet the needs of their subordinates. Notice that the higher order self-actualization needs are served entirely by intrinsic rewards. The esteem needs are served solely by extrinsic rewards.